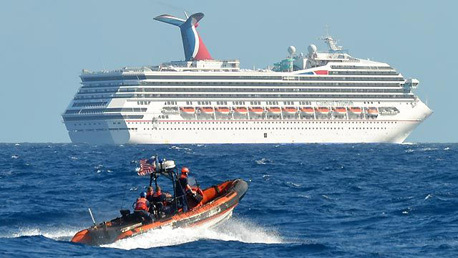 A third tug has been sent to assist in the rescue operation for Carnival Triumph, the cruise ship which has been without power since an engine room fire on Sunday. The tug is en route from Port Fourchon, Louisiana. It is expected to arrive at the ship later this evening to assist the vessel’s return to Mobile, Alabama, which it should reach tomorrow (Thursday). The U.S. Coast Guard remains on the scene. More than 200 Carnival staff will be on hand to meet the 3,143 passengers when they reach land; 1,500 hotel rooms have been reserved in Mobile and New Orleans and 100 coaches will be available. Some passengers have cars parked at Galveston, where they boarded the ship a week ago; others will be taken to Houston for flights home. Carnival president Gerry Cahill has admitted that conditions on the ship are “challenging.” Many toilets are not functioning and the air-conditioning is out of action. Passengers who have been able to contact family at home by phone and text have reported a foul sewage smell throughout the vessel. Carnival, who had already announced the cancellation of the next two scheduled cruises, now say the ship will be out of action until at least mid-April. Passengers have also been told that in addition to the previously-announced refund and a credit for a future cruise, they will be paid $500 each in compensation.